It's spring time! That means more biking. The weather on April Fools was a bit temperamental, but we managed to ride out from Brooklyn to Jackson Heights with no rain. Getting into Queens has gotten simpler now that we're on our third run. You should skip the Pulaski Bridge since its further west and just follow Greenpoint Avenue, which leads into Roosevelt Avenue. You ride straight on Roosevelt Avenue until you hit 73rd Street, make a left-- and you're at Rajbhog Sweets! Just like that. No getting lost this time, about a 10 mile ride one way. But remember: no bike lanes. Rajbhog Sweets sells sweets, but also a steam table of an assortment of vegetarian South Indian food. 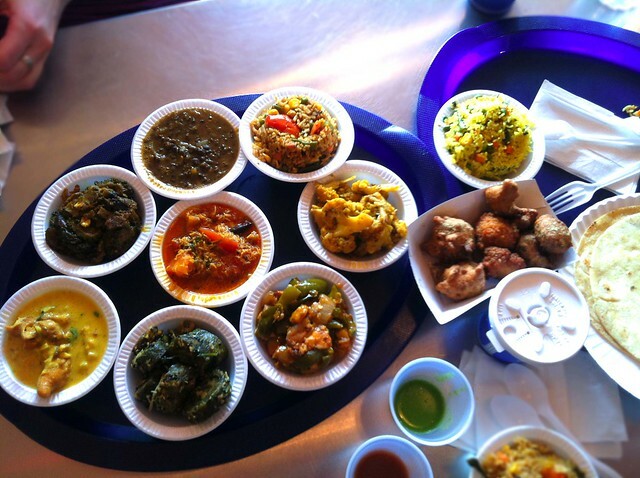 They had the familiar: saag (spinach), tadka dal (chickpeas), gobi (cauliflower). But there were some dishes that I've never seen before and the guys at the counter were nice enough to give us free samples before ordering. My favorite were the black lentils, dal makhani-- it was unexpected a) having black lentils for the first time b) enjoyed the spices. Being introduced to new food and experiences is all part of the adventure. :) Also the masal chai is amazing here. For the price of everything, I have no complaints. $6 for two bowls + rice. P.S. They microwave your food in styrofoam in case that bothers you...my mom is always lecturing me about that.